How do I select the screen orientation for my app? 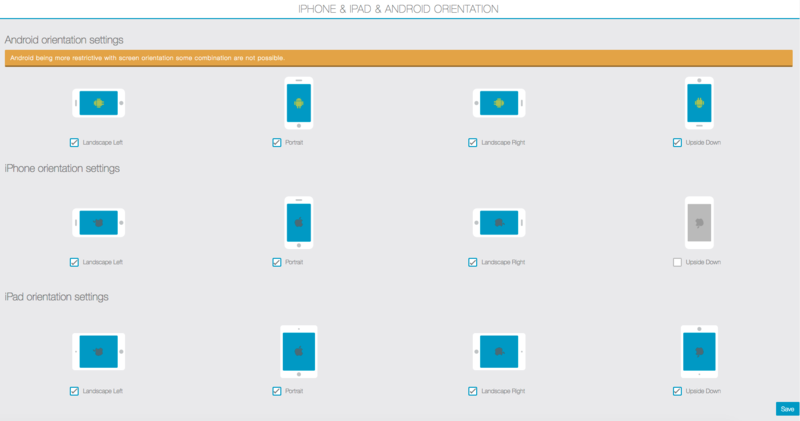 Home › Documentation › How To	› How do I select the screen orientation for my app? Follow the instructions below to select the screen orientation(s) that you want to use for your Android and/or iOS app (including iPads). 1) Log into your App Manager and select your app. 2) Click Settings then Advanced from the left-hand-side of the screen. 3) Scroll down to the section that says iPhone & iPad & Android Orientation. 4) Check the orientation options that you want to use, then click Save. 5) Your app must be republished for your selections to take effect in your live app. How do I change the background color of the radio player? For Layouts 90 / 39 / 59 / 69 how do I fix the slide-out menu from overlaying the phone icon’s status bar? I don’t see the updated source code (build) in my Apple Developer Account that you uploaded for me.